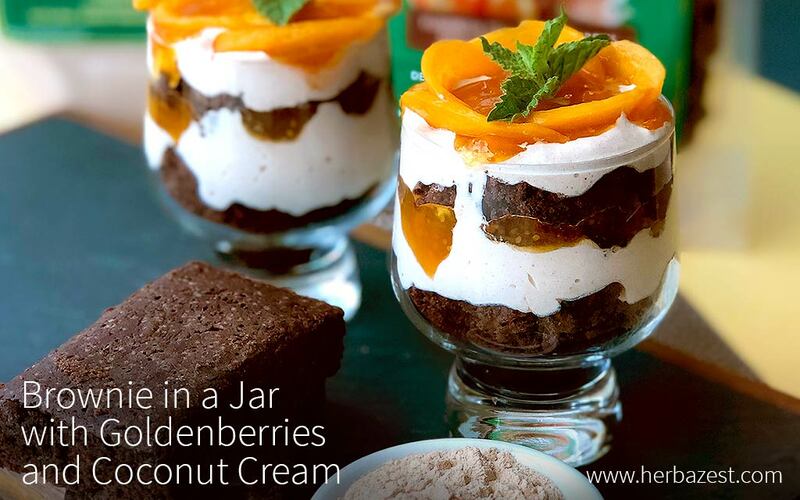 This brownie in a jar is bathed in a unique combination of whipped coconut cream and an exotic goldenberry jam. The good news is that it is actually made from wholesome ingredients, making it a much healthier dessert. Goldenberries are rich in vitamins A and C, among other nutrients, contributing to their anti-inflammatory properties. Coconut milk whipped with agave syrup and vanilla is a lighter substitution for the classic whipped cream. It is also a good source of vitamins and minerals helpful for maintaining healthy bones and strong hearts. Refrigerate the can of coconut milk overnight. This recipe is definitely a crowd pleaser thanks to its beautiful presentation and delicious flavor. To change things up a bit, try it with lucuma cashew cream or maca chocolate cream. You may also pair it with other fresh fruits, like peaches, papaya, kiwi, and more!